The Bahia Othon Palace in Salvador, Brazil is situated on the exclusive, small Ondina beach. Most rooms in the hotel offer stunning, idyllic balcony views of the Pacific Ocean. Close by, guests will feel at home shopping in the Barra Shopping Centre which is able to supply everything theyâll need. The active night life in Rio Vermelho is also just a short walk away from the hotel. From the outside, the hotel has a quite retro feel. On the other hand, the interior of the hotel is stylishly modern and offers round the clock 24-hour security, which was especially vital during the world cup. Due to the climate â air conditioning is freely supplied throughout the building. Wi-fi internet is also available. The hotel conveniently provides a rental service of cars at good prices as well as parking facilities. Inside the hotel guests can find a business centre for conducting meetings and a Salon where massages are offered and guests can relax. In addition, there is a panoramic rooftop pool, a spa, and two restaurants. 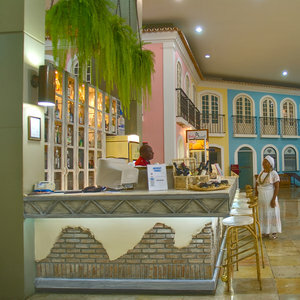 Due to the variety of tourists that come to visit Salvador, the hotel has five different types of rooms to cater to everyoneâs needs. The first types of the room are dubbed the Upper rooms and lie between the second and seventh floors. Secondly, the luxury rooms rest between the eighth and twelfth floors and have the benefit of providing the best views. Thirdly, there is the Junior suite which are slightly bigger than the first two. The last two types of rooms are the Executive suites and Presidential suites. The executive suite has a king size bed and two different rooms with different entrances. The final Presidential suite has a balcony with 180degree view of the region, three bathrooms and is the largest of the lot.